Quick Survey for K-State Research | 12345 FitTastic! 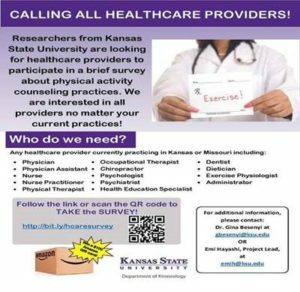 If you are a healthcare provider, please help by completing this brief survey about physical activity counseling practices. Follow this link to take the survey and contact gbesenyi@ksu.edu or emih@ksu.edu if you have questions.